Doodlebug Halloween Collections are ALWAYS my favorites, and Pumpkin Party does not disappoint! The candy, the trick or treaters, the kitty, even the spiders are cute!! (this coming from a girl who would burn her whole house down just to make sure a spider is dead...) It took a little time, but I was finally able to narrow down my choices to make a few cards... take a peek! 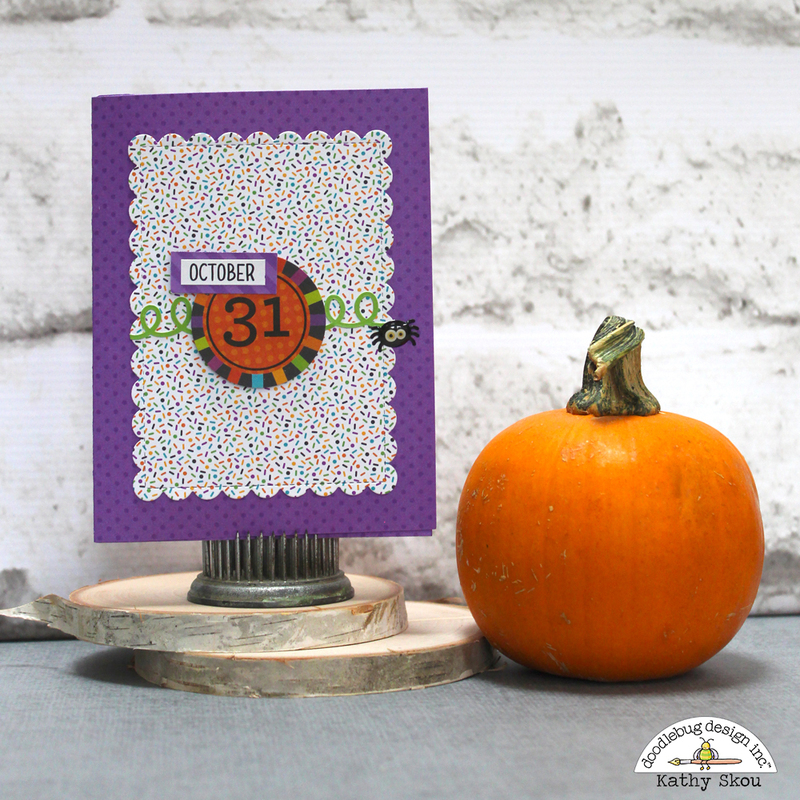 I just love all of the Odds & Ends, they make it so easy to make a little scene on a card! For my first card I created an inside shadow box card. There's a front to the card, but when you open it, there's a little dimensional scene. Here is the front of the card. I used one of the Odds & Ends, stickers from the This and That Sheet and one of the ADORABLE little spiders from the Silly Spiders Shaped Sprinkles. The papers are from the Pumpkin Party 6x6 pad and a sheet of Orchard Dot-Stripe Petite Prints. And when you open the card, you get a fun little scene using more of the Odds & Ends, a Chit Chat greeting and sprinkles! I just adore the kitty trick or treater!!! And that little mouse, cuteness overload! 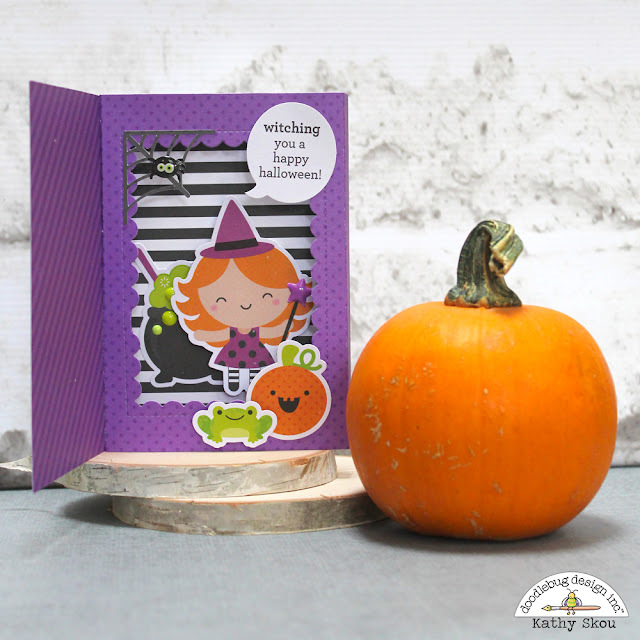 The background of the card is made up of the Pumpkin Party Double Sided Cardstock and Limeade Dot-Stripe Petite Prints. The fun stars are from the Halloween Night Sprinkles. My last card is another shadow box type card. I knew I just had to make a card featuring those spiders! The base of the card was made using Beetle Black Dot-Stripe Petite Prints. I added the spider web using the plaid side of the Jack and Friends Cardstock. 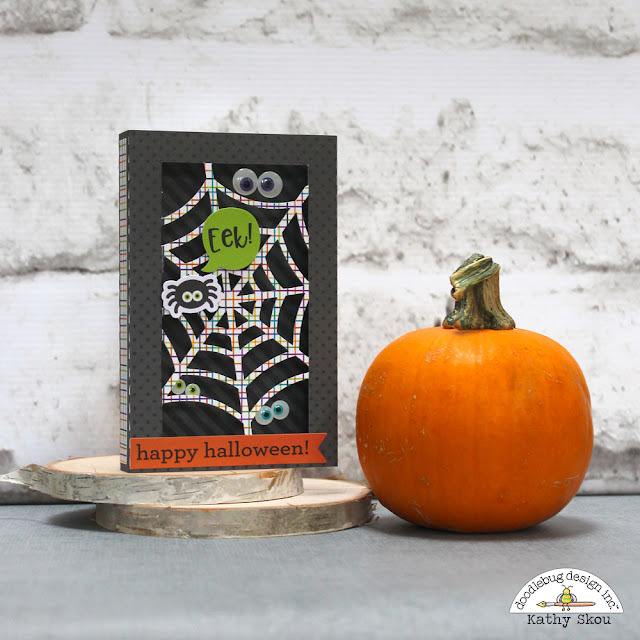 The spider is from the Odds & Ends and the eek and Happy Halloween are from the Chit Chats. My favorite thing about this card is that I added some of the spooky Eye See You Shaped Sprinkles inside the card! 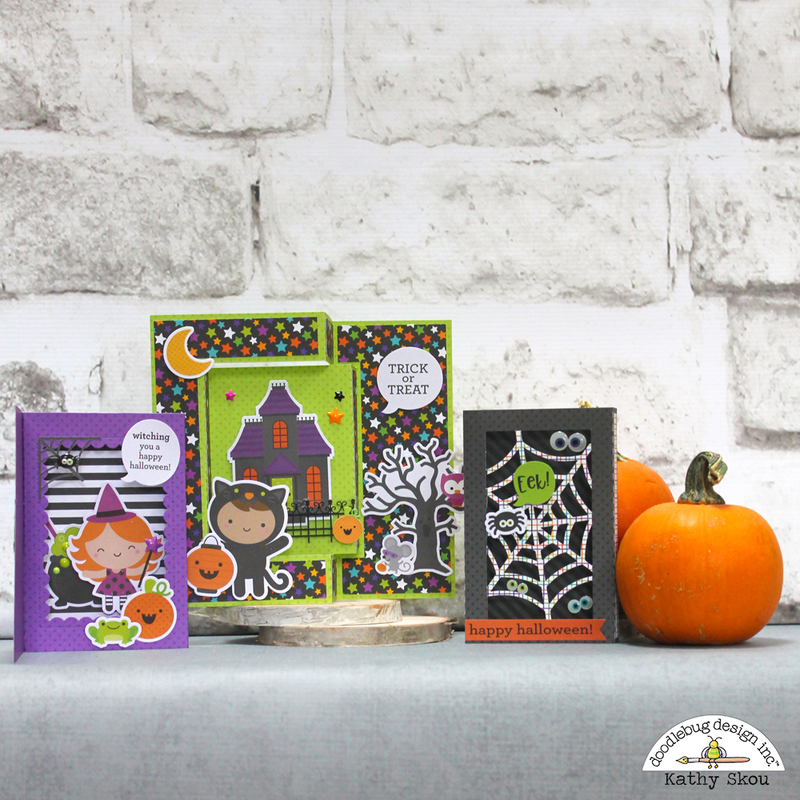 Have you used the Pumpkin Party Collection in any of your crafting? We would love to see your creations, so be sure to tag Doodlebug Design on Facebook and Instagram so we can see what you've made! That's it for me today, be sure to stop by the blog over the next couple of weeks for more Pumpkin Party inspiration! Thanks for stopping by to peek!